To celebrate Right to Read (April 1-5), Saint John the Baptist School on Dry Ridge Road in Colerain Township collected books to donate to HCJFS. The goal is to foster a love of learning. Students were encouraged and provided opportunities to read throughout the week. In the spirit of giving, the children were challenged to donate 1,000 books. Saint John’s students met and exceeded that goal by collecting 1,106 books. 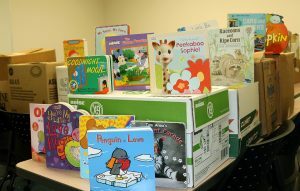 The books have been donated to HCJFS.They will be placed in the waiting rooms and visitation rooms at HCJFS and used to create a book “giving” library at our new Millvale site.